Credit: Brandon J. Iglesias, Photo taken from S-92 helicopter @ Block 252 in May 2010. Reactwell is developing a patent-pending mobile persistent state advanced well-kill technology to provide upstream oil & gas operators with remote well intervention operational capabilities. The EMOPP tool and accompanying services minimize liability associated with uncontrolled oil & gas releases, after mud-pit level/weight and Blow Out Preventer (BOP) defensive prevention equipment and systems fail for oil & gas operators. EMOPP technology is patent pending, permanently plugs void spaces, pipe, tube, casing and perforations. The tool is backed by test data and materially improves current industry state-of-art. EMOPP addresses an unmet safety and environmental need – to proactively respond and plug oil & gas leaks within hours after mud control and BOP failures occur – not addressed by current industry technology. 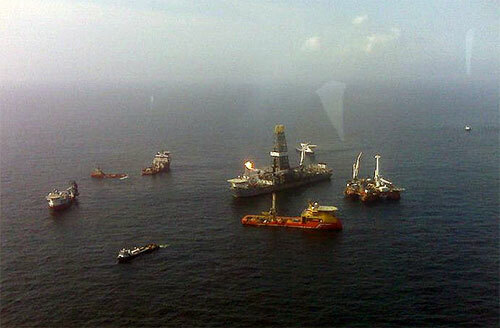 The EMOPP was built specifically in response to the Deepwater Horizon incident at BP’s Gulf of Mexico (GOM) Macondo Block 252 incident in May 2010. The technology may be used in response to future incidents as well as gas leaks, such as the Aliso Canyon oil & gas field, above Porter Ranch in California USA. Brandon J. Iglesias. “What went wrong at the site of the BP oil spill and what needs to change.” Princeton University Business Today (BT) Spring 2011, Pages 38-40. Print.